When everything is fishing well, we almost have too many fishing options available. Imagine trying to decide whether to fish for 25 pound pike on the surface, fresh sea lice covered salmon near the coast, hiking small creeks for arctic char in the mountain lake streams, rainbows and dollies on the Nushagak, Agulapak, Kvichak, etc., or a mixed bag grayling, lake trout and rainbows on our home river. That’s the dilemma our guests must face each day. By hosting just 10 – 12 guests per week, we have the flexibility to go where the fishing is the best for what you want to fish for, not where a pre-determined schedule needs you to go. Additionally, we have bear viewing, hiking, and kayaking options for those who would like a change of pace or just need a day to rest a sore fishing arm. 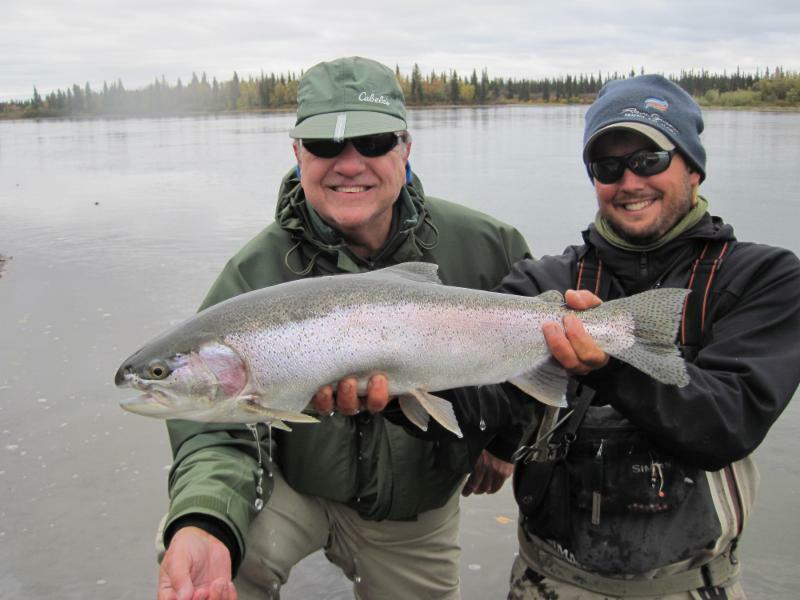 Royal Coachman lodge is located on the Nuyakuk River in Alaska, a great home river for the rare non fly-out days and for after hours fishing. The fly fishing lodge in Alaska has no neighbors, no boats, no cars, and no planes going by the lodge, just peace and quiet right on the river. We are located in the middle of the Wood-Tickchik State Park (the largest state park in the U.S.). 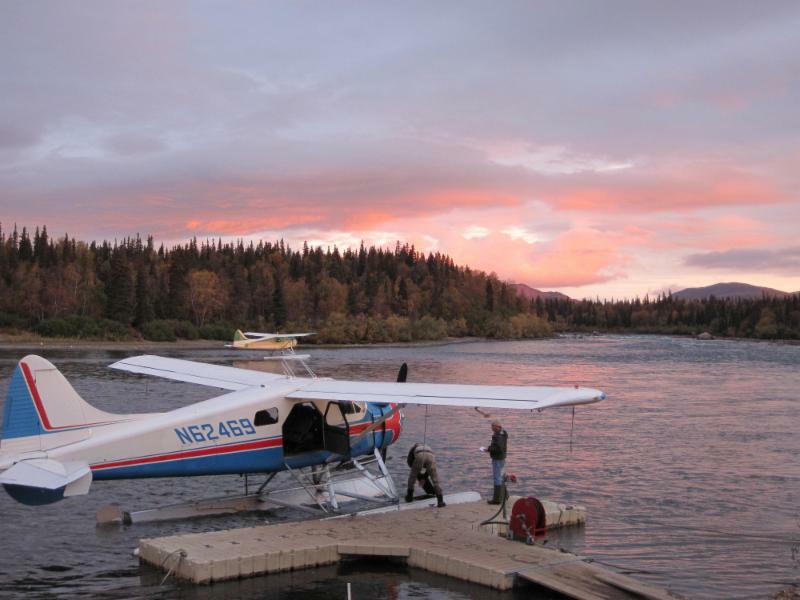 The fishing lodge in Alaska's capacity is only 10-12 guests (private groups up to 12), and with 2 Dehavilland Beavers, you will have complete flexibility. 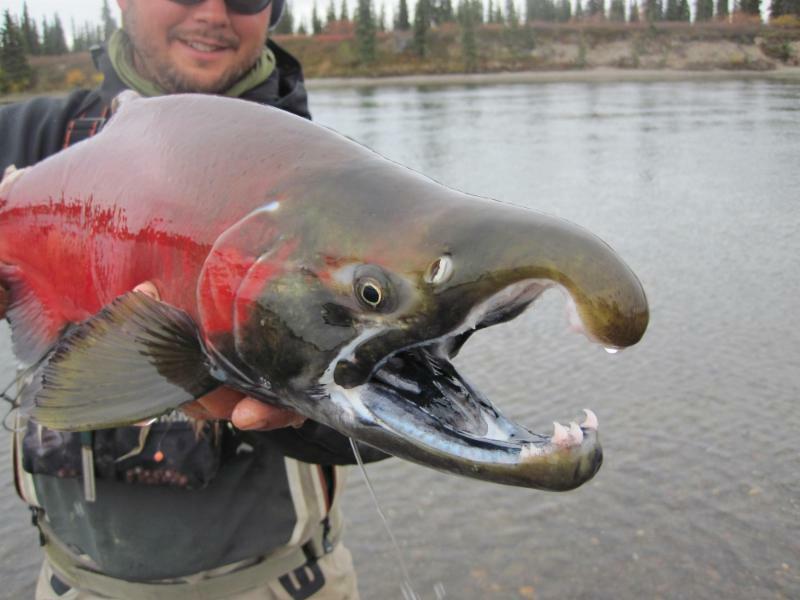 Our fishing guides are some of the best guides in the industry (our guides have on average 10 years of experience of guiding in Alaska) specializing in fly fishing in Alaska. With two exclusive permits in the Togiak National Wildlife Refuge, one private trophy trout fishery permit, permits to fish Katmai National Park and Wood Tikchik State Park, three department of natural resources permits, and nearly 20 boats cached throughout the best fishing locations in our part of Alaska, we offer an unsurpassed Alaskan fly fishing experience. We also offer discounts for groups of four and ten. Our primary goal is to have great fly fishing in Alaska with uncrowded waters and to provide anglers with the Alaskan experience they desire. 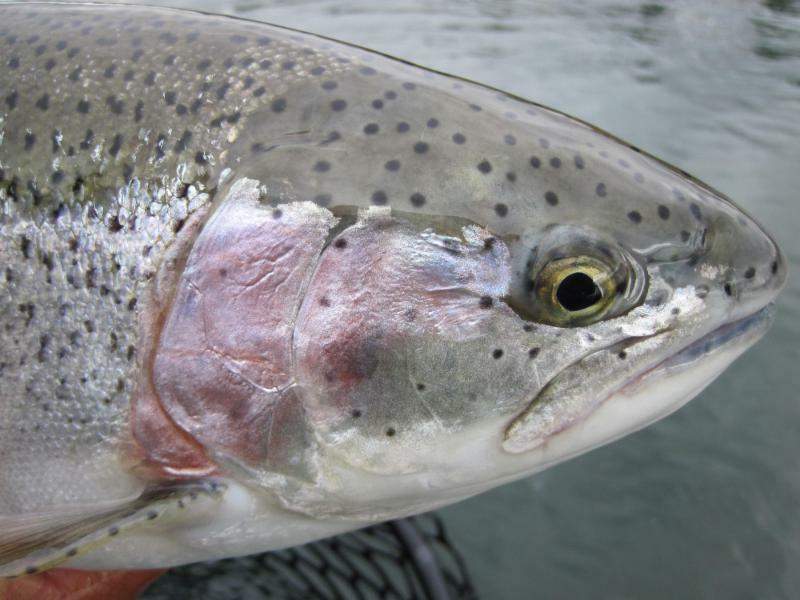 You can catch all five Salmon species, trophy Rainbow Trout, Char, Dolly Varden, massive Pike, Grayling, and even some Sheefish are available. Overlooking our home pool and catering to a maximum of 10-12 anglers per week (and private groups up to 12) and having 10-12 people on staff makes this Alaska Lodge one of the best. This small number of guests and large staff helps to ensure that you will have the maximum amount of personal service and attention that this truly world class fishing adventure offers. The fishing Lodge in Alaska houses the kitchen, dining room and lounge, library corner, one guest room with a private bath, and massage room. Comfortable and cozy, this is where you will plan each following days excursions. You and your guides will sit around the fire, and decide what type of fishing you would like to do, and plan the details of tomorrow’s outing. There is no pre-scheduled fishing program here. Custom tailoring each day’s fishing is one of the major advantages to our small and personal approach to sportfishing. The Royal Coachman Lodge in Alaska has been serving guests since 1970. Our philosophy and attention to detail has set the standard that others try to attain. It’s our trademark and we’re proud of it! We have four finely furnished guest cottages, one and two bedrooms, and private baths. We also have one well appointed bedroom in the main lodge. Each cabin or room has modern bath facilities, independent heat, excellent beds, and all the creature comforts of home, along with spectacular views of the river, and the rapids. We can sleep 12 guests, so you will have a lot of choices from single cabins, to family cabins. Arrival Day You will need to be in Anchorage on Sunday morning to catch a 1.5 hour charter flight to Dillingham (TBD in January 2018). You will land at the Dillingham International Airport. A Royal Coachman Lodge representative will meet you at the airport. Please note, occasionally we have delays on our side. There is a payphone in the waiting area, cellphones do not work in Dillingham. You will then be transferred in the Royal Coachman Lodge’s vintage van to Aleknagik, where our floatplanes will be waiting for you. This transfer takes about 30 minutes. We will pack the plane and leave for the lodge as soon as you arrive. Not everything fits in 2 beaver loads, so we return for the remaining luggage. You will arrive at the lodge around 3:00 p.m., and the luggage flight will not get back to the lodge until roughly 6:00 pm. Upon arrival the manager will discuss the week's itinerary with you, check and/or sell licenses, and have guests sign waivers. Appetizers and a hearty dinner will be served around 6:30 p.m.
Monday – Saturday: Full fishing days! You will generally have breakfast at 7:00 a.m. and depart at 8:00 a.m. You will return around 6:00 p.m. after a full day of fishing. Dinner is usually served at 7:30 p.m. Repeat! Departure Day: We normally have a luggage run at 8:00 a.m., so you will need to pack in the morning before breakfast, which will be served at 8 a.m.. After the luggage plane leaves you will have time to settle up with the manager for your bill which will include alcohol, fishing licenses, apparel purchased, and gratuities. After breakfast you will depart in our beavers for Dillingham. You will depart Dillingham on a private charter to Anchorage. *Price includes lodging, guided fishing, and meals. Price excludes travel, license, fishing equipment and gratuity. First time to Alaska and it exceeded my expectations. The Lodges and Guides are top rate, and the fishing is epic! Not only did we catch a lot of fish, but learned valuable techniques from experienced guides. Highly recommended. © Copyright 2016 International Angler. All Rights Reserved. Built with Volusion.